Today I’m sharing a healthy recipe with you that will please your taste buds while taking you one step closer to achieving your fitness goals. 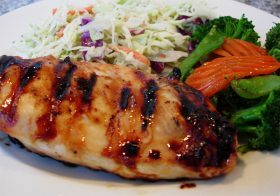 The honey-mustard glaze has a wonderful tangy flavour. Remember to add healthy side dishes for a complete fitness meal that will satisfy without weighing you down. 1. Pre-heat your grill. If using coals, heat until the coals turn grey and there are no longer strong flames, 35-45 minutes. 2. Combine honey, mustard, lemon peel, soy sauce and garlic. Mix well. Reserve a few tablespoons of the sauce. Add chicken and marinate in the refrigerator for 40 minutes. 3. Cook the chicken 5 to 6 minutes per side. Brush with the reserved sauce, and continue cooking for an additional 3 to 4 minutes per side, until chicken registers 170 degrees F on a meat thermometer. Serve with a side of veggies. Enjoy! One serving equals: 183 calories, 2g fat, 13g carbohydrate, 0g fibre, and 28g protein.